psychological testing from Patrick de Gramont Ph.D., at Presbyterian Hospital's Division of Psychology, on March 15, 1976. 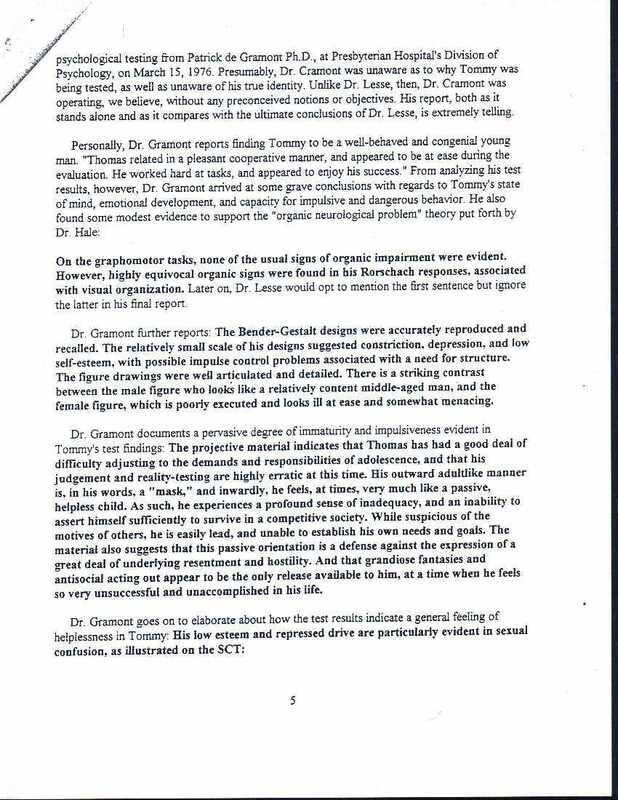 Presumably, Dr. Gramont was unaware as to why Tommy was being tested, as well as unaware of his true identity. Unlike Dr. Lesse, then, Dr. Gramont was operating, we believe, without any preconceived notions or objectives. His report, both as it stands alone and as it compares with the ultimate conclusions of Dr. Lesse, is extremely telling. On the graphomotor tasks, none of the usual signs of organic impairment were evident. However, highly equivocal organic signs were found in his Rorschach responses, associated with visual organization. Later on, Dr, Lesse would opt to mention the first sentence but ignore the latter in his final report. Dr. Gramont further reports: The Bender-Gestalt designs were accurately reproduced and recalled. The relatively small scale of his designs suggested constriction, depression, and low self-esteem, with possible impulse control problems associated with a need for structure. The figure drawings were well articulated and detailed. There is a striking contrast between the male figure who looks like a relatively content middle-aged man, and the female figure, which is poorly executed and looks ill at ease and somewhat menacing. Dr. Gramont documents a pervasive degree of immaturity and impulsiveness evident in Tommy's test findings: The projective material indicates that Thomas has had a good deal of difficulty adjusting to the demands and responsibilities of adolescence, and that his judgement and reality-testing are highly erratic at this time. His outward adultlike manner is, in his words, a "mask," and inwardly, he feels, at times, very much like a passive, helpless child. As such, he experiences a profound sense of inadequacy, and an inability to assert himself sufficiently to survive in a competitive society. While suspicious of the motives or others, he is easily lead, and unable to establish his own needs and goals. The material also suggests that this passive orientation is a defense against the expression of a great deal of underlying resentment and hostility. And that grandiose fantasies and antisocial acting out appear to be the only release available to him, at a time when he feels so very unsuccessful and unaccomplished in his life.